Why is it that everything about Ladakh excites us? I mean, what can describe the child-like excitement that one feels upon having the first glimpses of its incredible landscape? Everything about Ladakh, its lakes, mountains, weather etc., seem to have sprung right from our dreams. You will know what I am talking about, only if you have been to Ladakh. Ladakh will keep you excited in many ways, and one of that is its cuisine. Believe me when I say, Ladakhi cuisine stimulates your taste buds and surprises it with its uniqueness. The color and flavor of the dishes surprise the first time visitors. 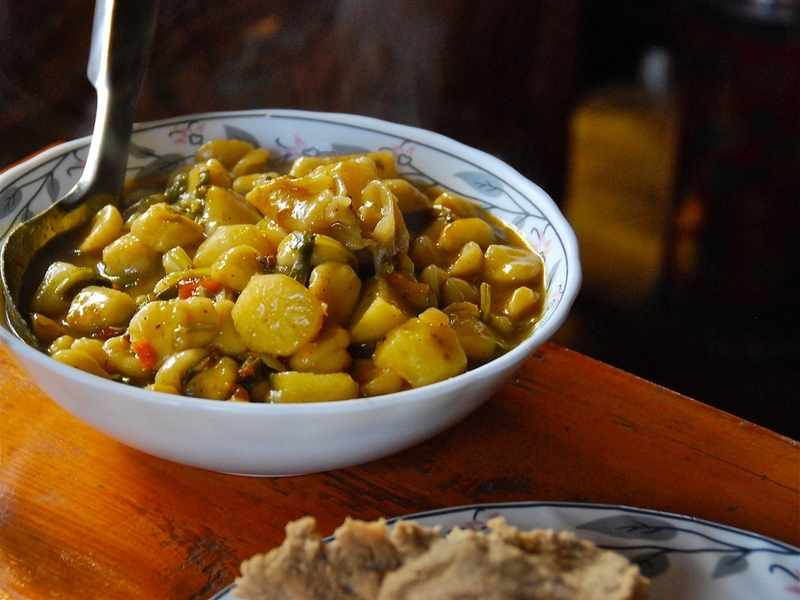 Most of Ladakh’s dishes are a wonderful mixture of meat and vegetables, an example being the Thukpa. This blog on the 7 handpicked delicacies from Ladakhi cuisine will give an idea of the kind of dishes that you should try on your next trip to the “land of the passes”. During your travels through Ladakh, you will always meet the Thukpa. After all, it is one of the most consumed food of Ladakhi people. 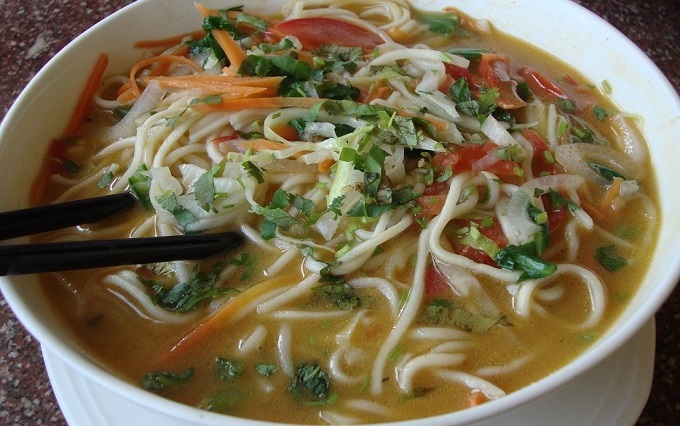 Thukpa is essentially a noodle soup with boiled vegetables, pieces of chicken, pork or mutton served with spicy “chutney” to lend it a tangy flavor. Thukpa is best had with “khambir”, a locally baked bread, and when the two go together, its pure happiness! You will find this simple yet healthy meal available in every little café or street stall. The popularity of Thukpa can be attributed to the influence of Tibetan culture in Leh. When its snack time or meal time in Ladakh, Tigmo is the go-to meal. 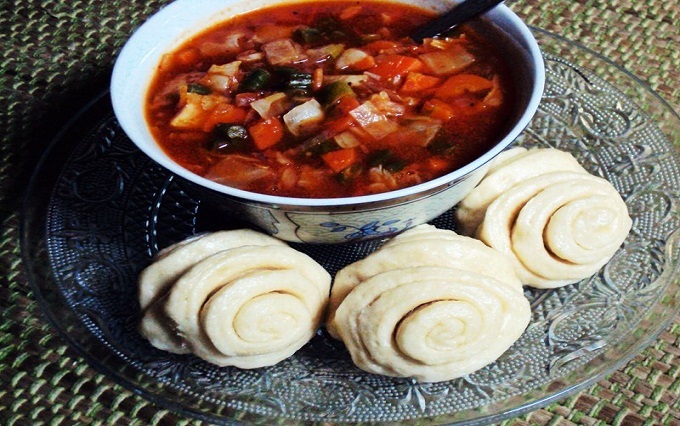 One of the most popular dishes in Ladakh, Tigmo is a form of fermented and steamed bread which is served with a veg/non-veg stew. The preparation of Tigmo requires a lot of vegetables. However, this dish also comes in its non-vegetarian avatar. You must have eaten momos in your city, but trust me when I say, the momos found in Ladakh are the real deal. Momos in Ladakh are actually what momos are supposed to taste like! Made with simple flour and water dough, they are generally stuffed with minced meat, vegetables and cheese. It is served with soup or chilli sauce. Yum, now tell me that doesn’t make your mouth water! Do you, like me, find bread to be boring sometimes? Well, get ready for a change. In Ladakh, bread is famously known as Khambir. The staple food of the Ladakhi people, it is pan-shaped, brown in color with a thick crust and made from local whole wheat. Just add a layer of jam or butter on it, and you are good to go. You can have it whenever you feel like. However, it’s mainly served for breakfast with butter tea/ salt tea. Fruit jam, mixed jam or pineapple jam? 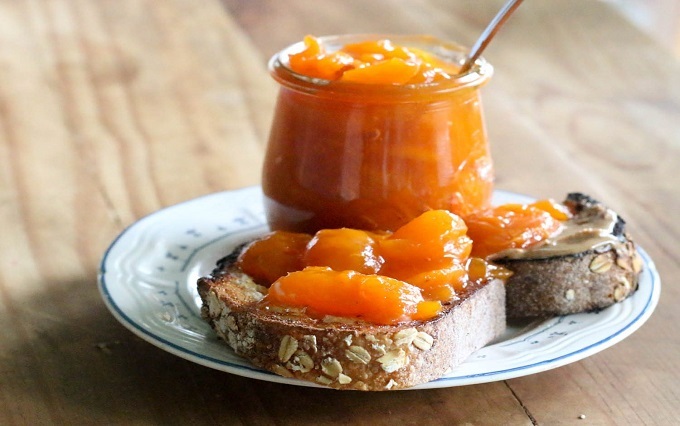 Nah, here’s Apricot Jam. In Leh, you will find a variety of products made from apricots, from pickled apricots to apricot facepacks and scrubs. Made from pure apricots plucked straight out from fields, its also as organic as it gets. Try this jam and take some with you. What would a combination of momos dipped in soup taste like? The answer, Moktuk. 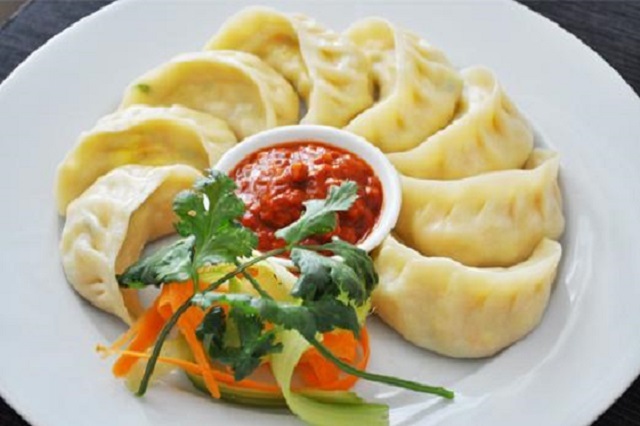 A fascinating dish which is basically momos dipped in soup and enhanced with spices and vegetables. It’s fulfilling, tasty and nutritious. What more could you ask for? 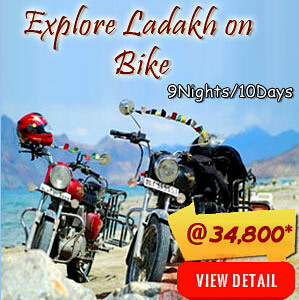 Is the cold of Ladakh bothering you? Try some Skyu, the comfort food of Ladakh and a daily meal for most its inhabitants. A traditional soup dish, it’s made with soft wheat dough kneaded into thumb-sized balls and cooked with meat and vegetable stew. Various kinds of vegetables like carrots, turnips and potatoes are used in its preparation. It is filling and usually accompanied by dumplings and momos. Sometimes, joys in Ladakh come in very small sizes, for example, the Chhupri, or Yak cheese. Feeling bored? Pop a Chhupri. Want something to chew on? Go for that Chhupri. 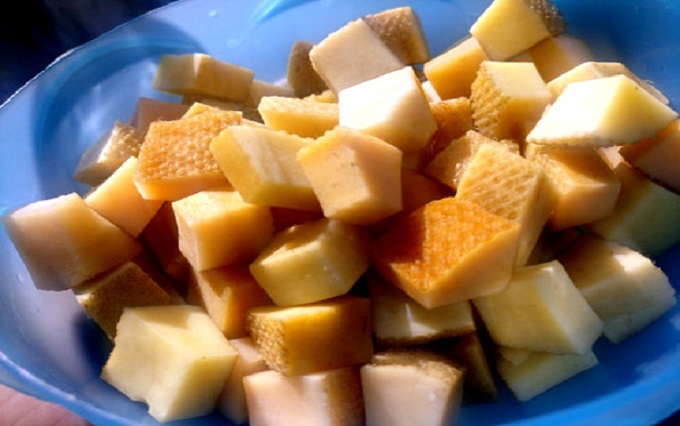 Made by adding lime and other citrus fruits to Yak milk until it is churned, it’s a favorite snack of the people here. The chhupri is meant to be sucked lovingly, slowly and steadily. From side to side, up and down, let your tongue and mouth play with it till you gradually get a hint of its taste. You must have tasted lemon tea, herbal tea, white tea and yellow tea, but butter tea? And, what’s this Chaang? 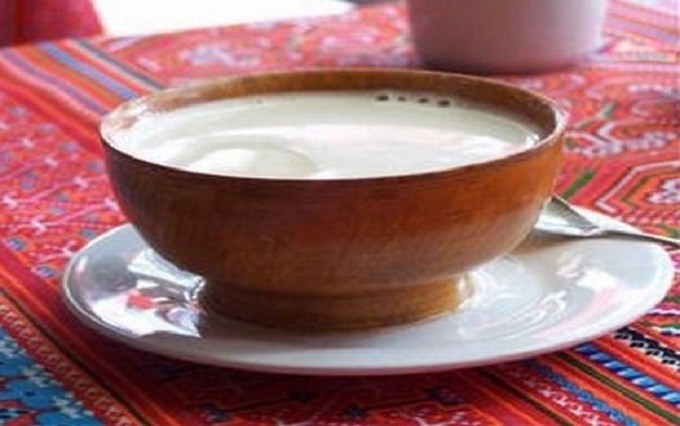 Butter tea is made from green tea leaves, yak butter and salt. Although it may taste quite weird at first, but once you get used to it, it’s the perfect companion in the cold weather. Chhang, on the other hand, is a local brew made after fermenting the miller with yeast in a traditional porcelain pot. When you visit Ladakh, try Chhang. You will know what makes it so loved by the people. 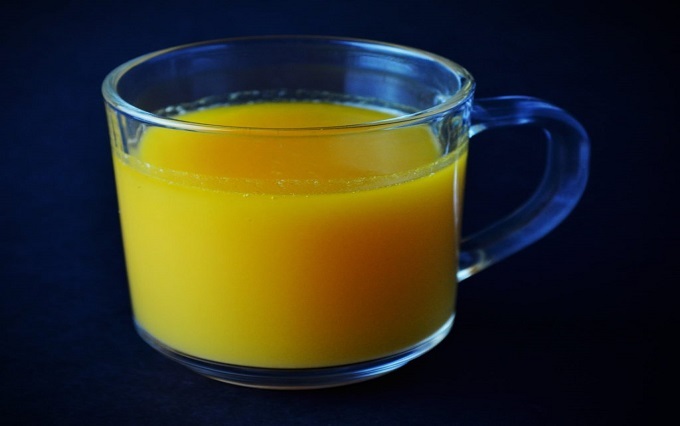 Seabuckthorn juice has come a long way, ever since it was used for setting up fences. Now, it’s a healthy nourishing juice loved by the residents of Ladakh. Made from “leh berries”, it is rich in Omega 7 fatty acid, which means that it is enormously beneficial for the skin and nourishes it from the inside. For the people in Ladakh, Qahwa is a comforting drink. No matter where you go, you will be offered this soothing drink by the locals. It contains saffron and cinnamon and has a soothing effect on the body. If you want to taste Qahwa long after you’ve left Ladakh, you can buy ready to make Qahwa powder brands from the local grocery shops. North Indians love their chole-kulche, and it finds its presence in almost all eateries and hotels. However, the Kulcha in Ladakh comes with a difference. Here, the Kulcha is best enjoyed with butter tea or Qahwa. In Ladakh, people generally eat Kulcha as an alternative to biscuit and is mostly consumed during the evening. Its round shape and crispy texture is quite inviting. 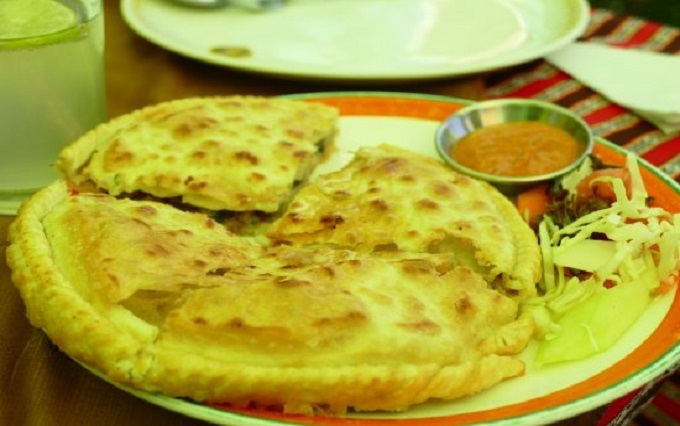 It’s quite interesting to know that Kulcha traces its origins to Tashkent and enjoyed an immensely popularity in Timor.